As we honour our pals across the Pacific continuing to raise a loving hell on behalf of the babies that are being caged by Prez#45, (truly: my pal flew from SFO to DC to chant loudly and get arrested. Bless you, thank you! ), those of us in somewhat saner Aotearoa deal with challenges of different sorts. Life is holy and complex, as it is mundane and relentless. The clock is a tyrant, and relationships are everything. Anyway, friends, today’s picture is of the most recent issue of OHbaby! magazine, which holds two articles that I am proud to have written. One is about Respect, the other about toddler development. Which are a couple of my favourite subjects. Here is a lil something from Scientific American, about what babies know, and here is something for all the solo parents out there: a Buddhist perspective on the teachings available just for you. Meanwhile, this gift is for all parents of every ilk … it’s about self-compassion. Yikes. I’d never seen this particular Dan Siegel talk till my gal Pennie Brownlee sent me the link earlier in the week … I am grateful! (You will be too) … and it is kinda cool how a seemingly unrelated link from a seemingly unrelated source (my dear friend and superstar of academic pediatrics, sharing this piece about Ubuntu) is so in harmony it’s not even funny. Or even a y’all, y’all. Somehow the coincidence of receiving both those links on the same day feels like confirmation. Less perky is this link, shared by another wise woman. Electrosmog? Jeez Louise. Imma learn more about that. You know I’d be happy to have waaaaaaaaaay less tech in schools, and I certainly think that we oughta teach our young ‘uns to think more critically about the tech they’re using. For example – how do we teach children to examine the news for potential biases? Take a break from the screens, homies. And consider different ways of using tech – LOVE the work of Tristan Harris and chums, and here is another effort to rejig the current scene. Finally, a cool fact I did not know about breast milk, specifically how it changes along with a mother’s circadian rhythm. Not enough o’s in cool, baby. Warm soup and winter sunshine. What a joy it is to be alive when you’re fortunate in the birth lottery (yay, NZ in the 70′s! Yay! Thanks Papatuanuku!) but jeepers, mate, there is lameness and horror a-plenty. I was just crapping on to my big brother over coffee a few days back about how if we could just ask all scenarios an overarching question (be the scenario designing a town hall, or prioritising health funding, or creating immigration policy) all would shift. What would this mean for babies? Whatever it is. Going for a walk. Approving an irrigation scheme. Consent processes and elected officials would all have to prove how their decisions impact babies. Most parents are pretty good at considering how their decisions impact their own babies (“if we stay for dinner, what does that mean for our bedtime routine?”), so we must now all consciously expand to our infuse all our decisions, large and small, with babyhood. Because if it’s good for babies, it’s good for everyone (friends! You know why! Because attachment and neurobiology and human potential. Because overstimulation and pace and wellbeing. That’s why! The only group I can think of who will suffer if we truly prioritise infant wellbeing are those with financial interests in selling nonsense to babies’ families. And they can stuff off, anyway. We have a rare opportunity here, because our Prime Minister just gave birth to her first child. Well done, Jacinda! And now you get to view decisions large and small through a lens you didn’t even know existed. None of us knew, till we knew. Welcome. Nau mai, haere mai. Welcome, Baby Neve, to the world. And welcome, Jacinda, to motherhood. Kia Ora my friends. 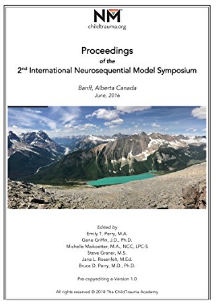 Here is the image that accompanies the Proceedings of the 2nd International Neurosequential Model Symposium from 2016. Y’all, I was there! 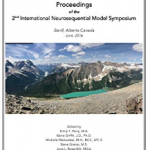 I presented (and sobbed.) And guess whose scrappy l’il piece closes out this auspicious document? Can you even stand it? Because I’m not sure I can! Now I need to share some links, before my cranky old bones prohibit any more computer work. First, get ready for outrage, and then please share it with at least a half-dozen of your pals in education. This is an article about the way that Google has infiltrated schools and is making loyal clients of children, and praps it’d be a good time to brush up on the ways that a Google search is not a neutral beast. How many of the children googling away in their classrooms today know this? How many of their teachers have even considered it? NOW, then: check this out … from PC Mag, no less, making the case for less tech in classrooms. It exposes that same notion: that tech in schools is for the benefit of advertisers and companies, not children. UGH. And LOOK at the lengths that tech companies will go to, distancing themselves from the idea that they have a part to play in child wellbeing: “Our children’s apps aren’t directed at children.” PARASITES. We simply must share the truth about the ways that we (and worse, our kids) are being manipulated! Love you, Tristan Harris!! For resources, info, inspiration and community in the fight against such nonsense, please behold the proceedings from the first Children’s Screen Time Action Network conference. I know, you gotta get online. Irony is a funny gal. And ALL HAIL Maryland, who seems to be leading the way in having legislative challenge to the “all-tech, all-the-time” school landscape. Instead, we gotta emphasise what children need. They need time with their family (mate, I LOVE this article ….) They need actual humans to read them stories. They need adults to pay attention to what they actually need! And they need schools that do more than just market to them. Meanwhile, we need to spend time offline (quiet time alone, every day! SWOON!) we need to resist the pace of the on-demand lifestyle, we need a bloody good night’s sleep, and we need community. An article here from Mothering with a new take on the ACE study, and this is a link to an article I wrote aaaaages ago, for our pals at OHbaby! mag.